A NICE PAIR OF QING DYNASTY SHANXI ELM WOOD CHAIRS, 19th Century, China. Good condition. Size: H. 117 cm. D. 56 cm. x W. 45 cm. 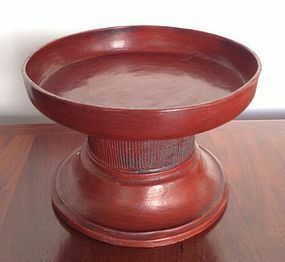 An attractive antique cone shaped 6-piece Lacquer Food Offering Bowl from Burma, 19th Century. Good overall condition, some wear due to age. 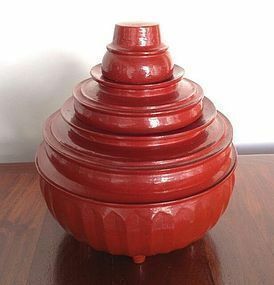 This type of handmade lacquer offering bowl has 6 compartments which are removable and were used to make merit by offering various kinds of food to the monks in the temples. Size: H. 40 cm. x 36 cm. 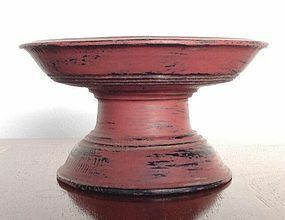 diameter in the center. 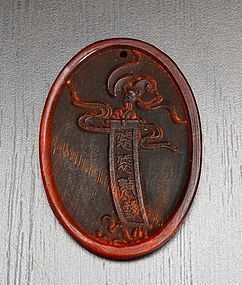 An ancient Chinese Horn Pendant/Talisman depicting a symbolic Bat with a Scroll and auspicious calligraphy. Good condition, Size: H. 2" x W. 1.5"
A rare round African Metal Hatchet/Axe with markings and a carved Horn handle. Good condition overall. 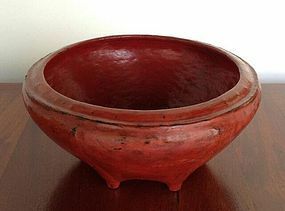 Size: Length 13 3/4" (35 cm.). 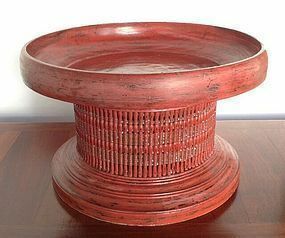 For African Art Collectors! 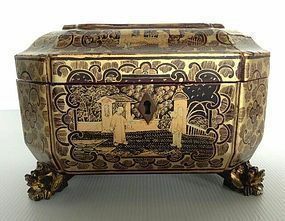 A superb and very finely decorated octogonal 19th Century QING DYNASTY Black-Gold Lacquer Tea Caddy depicting detailed people, landscape and architectural scenes. Made in Canton for export ca. 1840. Has beautiful inside painting as well as gold Dragon feet with open red mouths. 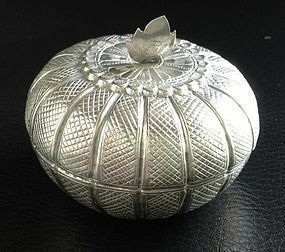 Very good overall condition, no pewter container included. Size: L. 8" x W. 5 1/4" x H. 5 1/2" (23 cm. 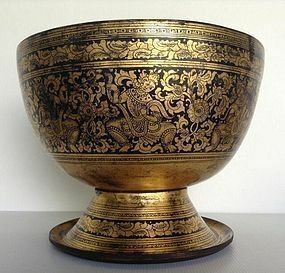 x 13.5 c. x 14 cm.). Additional images available on request. A rare KHMER BRONZE Statuette of Lakshimi, Goddess UMA, consort of SHIVA, holding lotus buds. 12/13th Century Post Bayon/Angkor Wat. Size: H. 8 cm. x W. 3 cm. x D. 2 cm. Very fine specimen, good condition. 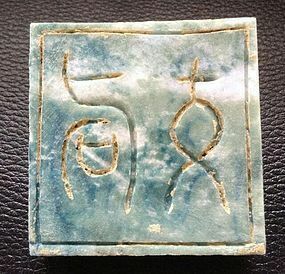 This bronze was made by lost wax process and has a beautiful naturally formed patina: surface encrustations, malachite, azurite and calcite consistent with the period and environment of similar recorded museum pieces. No restorations or false patina. A solid 24K. 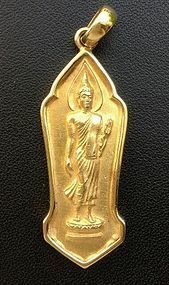 Gold Thai BUDDHA JAYANTI Amulet with 24K. Gold Casing and Loop for hanging made for the special celebration commemorating 2500 years of the death of the Lord Buddha. Good condition, used. Size: Height 5 cm. x Width 2cm. (Gold loop measures additional 1 cm.). Total weight 26.1 gr.